Rebecca of Sunnybrook Farm. Unabridged. 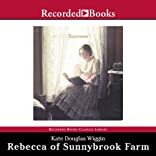 Author Jack London wrote Kate Douglas Wiggin a letter about her classic Rebecca of Sunnybrook Farm from the headquarters of the First Japanese Army in Manchuria in 1904: "May I thank you for Rebecca?... I would have quested the wide world over to make her mine, only I was born too long ago and she was born but yesterday.... Why could she not have been my daughter? Why couldn't it have been I who bought the three hundred cakes of soap? Why, O, why?" Mark Twain called Rebecca of Sunnybrook Farm "beautiful and warm and satisfying."